For many people finding a special old cookie jar at an antique show or flea market inspires a flood of happy memories that makes them quickly realize the antique cookie jar value is far more than monetary. Although An Illustrated Value Guide to Cookie Jars by Ermagene Westfall was originally published in 1983, it was updated in 2003 and includes the market prices of that year. This book is a valuable resource for identification as it includes hundreds of beautiful color photographs. The Ultimate Collector's Encyclopedia of Cookie Jars: Identification and Values by Joyce and Fred Roerig includes more than 1200 photographs. Cookie jars, just as all antiques and collectibles, have many different values. Many collectors are interested in the monetary value attached to their cookie jar collection. They hope their cookie jars continue to increase in worth making them more valuable on the collector's market. However, for many collectors, cookie jars hold a special kind of magic. They remember them filled with special treats lovingly made by grandmothers and mothers. Others think of them as the family piggy bank, where the household money carefully was tucked away as they waited for mom and dad to announce there was enough for that special toy or new two-wheeled bicycle. Without question antique cookie jars hold a special place in the hearts of many people everywhere. 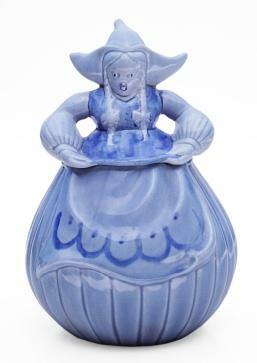 For many collectors, antique cookie jar value is determined by monetary value, market conditions and memories.